Today the American Institute in Taiwan held a banquet celebrating 40 years of the Taiwan Relations Act. Present at the event was former speaker of the U.S. House of Representatives, Paul Ryan, who is visiting Taiwan for the first time. 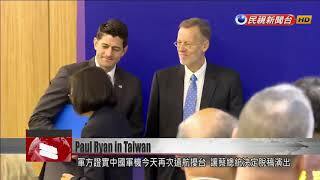 Ryan had high praise for Taiwan's democracy, saying that the U.S. wants the rest of the world to be more like Taiwan. President Tsai Ing-wen, who also spoke at the event, thanked the U.S. for upholding its commitment to the TRA. Former House speaker Ryan is here in Taiwan with a delegation to celebrate the TRA’s 40th anniversary and to show affirmation of Taiwan’s values. We want the rest of the world to be more like Taiwan. Taiwan actively uses its own experiences not only to help others but to help others help themselves. The world desperately needs more of Taiwan’s brand of leadership. The TRA is more than just a policy. It’s a commitment of the values of freedom and democracy. And that commitment has defined the partnership between Taiwan and the U.S. and made us an indispensible force for good in the region and around the world. As the two sides celebrated their warming relationship, trouble was stirring across the strait. Taiwan’s military confirmed today that the PLA had dispatched jets once again in an act of provocation against Taiwan. Today President Tsai went off-script to address the incident. China recently has increased its military activities in the region. In fact, just today the Chinese air force flew military aircraft over Miyako Strait and Bashi Strait, further challenging the stability in the Taiwan Strait and this part of the world. It damages the cross-strait relationship and it damages any attempts by China to win the hearts and minds of the Taiwan people. Amid escalating cross-strait tensions, Moriarty’s remarks are a welcome expression of U.S. support for Taiwan and a sign of deepening relations.